Description: Wisconsin reportedly has twenty-four species of Goldenrod. Most are known for the bright yellow flowers that generally appear later August into October. 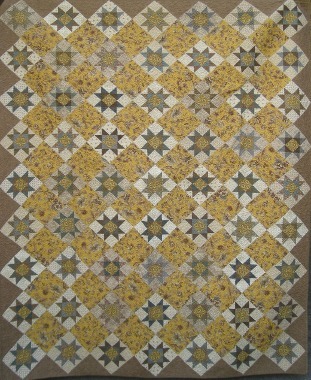 This quilt has that beautiful late-summer golden color with the supporting colors of gray-blues and soft browns. Enjoy the season while making the Ohio Star blocks in this quilt.